It’s been a beautiful fall here in western Montana, full of sunshine and colors. This followed on the heels of a wonderful summer that, while dry and frequently hazy, wasn’t too hot and only occasionally saw wildfire smoke filtering into our valleys. Perhaps you found yourself thinking, “Maybe wildfire smoke isn’t such a big deal.” You’d be wrong. 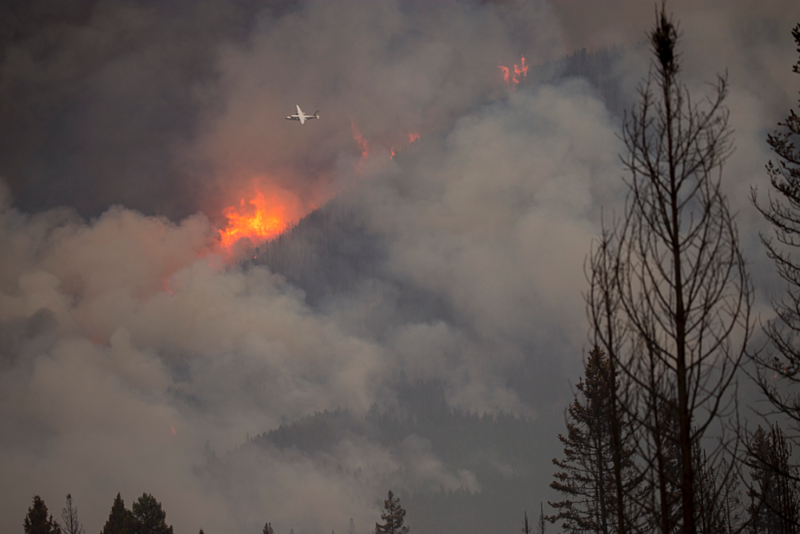 While western Montana dodged a severe wildfire season, folks on the West Coast weren’t as fortunate. Fires are still burning in Oregon and California, and communities in that region have been dealing with wildfire smoke for months. Most of us remember the suffocating smoke of 2017 and know we’ll be hit again. Over the past 20 years, we’ve seen wildfire smoke return again and again to our area. Not every year is a smoky one, but with climate change driving hotter and drier summers, the trend of increasing wildfire smoke is only going to continue. To make matters worse, wildfire season itself has been lengthening, stretching into the fall. In 2017, the wildfires in Montana started in July and burned into September. Smoke is dependent on many factors – fire location, topography, weather patterns, etc., but we can assume it will be a regular visitor to our valleys. This is why Climate Smart Missoula and the Missoula City-County Health Department (MCCHD) have been working together to help our community adapt to the changing summer and early fall conditions. For the past few years, we’ve challenged ourselves to think hard about the health of our most vulnerable residents and how we can provide not just advice about what to do when smoke arrives, but actual clean air, as well. This is driven in part by the fact that wildfire smoke enters buildings. If there is no mechanism in place to clean the indoor air, it’s only a matter of time before the smoke inside matches the smoke outside. We know that the fine particulate in smoke has serious health implications and the more a person is exposed, the more harmful it is. The elderly, people with heart or lung disease, pregnant women, and young children are most at risk. As wildfire seasons get longer, it becomes more and more important that we take steps to clean our indoor air. Back in 2017, Climate Smart took aim at this challenge and launched a pilot program focused on providing free portable HEPA air cleaners to homebound seniors who are at risk of health complications from wildfire smoke. When the Rice Ridge and Lolo Peak fires sent thick smoke into Missoula County, Climate Smart and MCCHD worked to get portable HEPA air cleaners into the hardest hit classrooms. These projects were effective and meaningful to the recipients, and we’ve been determined to expand our efforts. Children and infants are especially vulnerable to wildfire smoke, which is why this summer we focused on schools and daycare centers. We were inspired by a young girl who started her first day of preschool in 2017 in good health, only to spend the next few days in the hospital due to smoke exposure. Her preschool did not have a way to provide clean indoor air for their young charges. 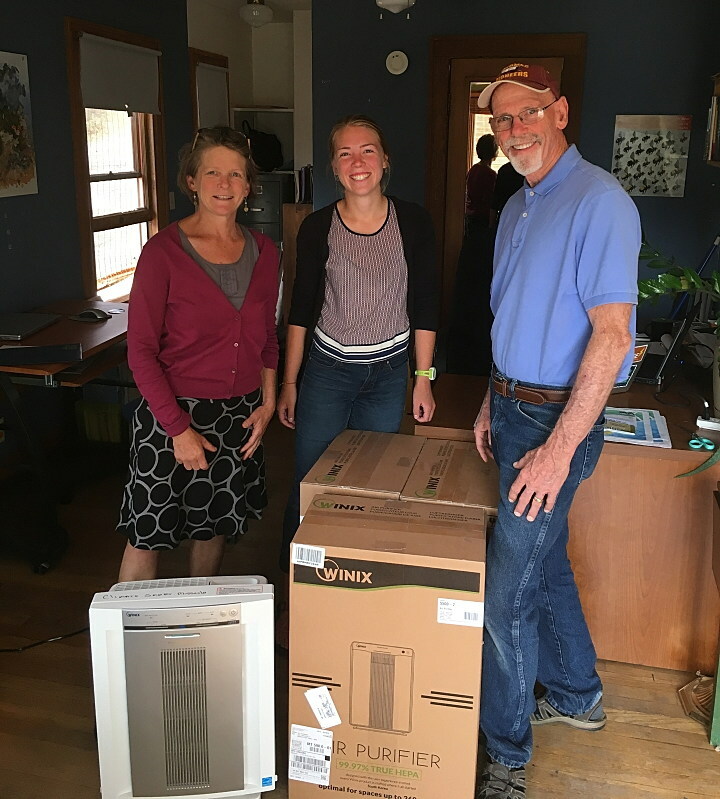 This year, before wildfire season arrived, Climate Smart and MCCHD distributed almost 100 portable HEPA air cleaners to 32 daycares and preschools in Missoula County, providing clean air for more than 500 young children. This year, that young girl’s family sent her to school knowing there would be several HEPA air cleaners running in her classroom, keeping the inside air healthier whenever the outside air deteriorated. Climate Smart Missoula providing the Potomac School three portable HEPA air cleaners for use in the classroom of one particularly sensitive young student. In addition to providing clean air for our youngest children, we compiled an air filtration needs assessment of the public schools in Missoula County. With funding from the United Way of Missoula County, we systematically identified which schools have updated HVAC systems, which schools lack adequate filtration, and the number of classrooms that need intervention to have clean air the next time smoke rolls in. This assessment will help Missoula understand how we, as a community, can protect our students’ health. We detail our youth efforts here. Although all of our little ones are at risk during smoke events, some school children have unique health needs that place them at even greater risk. After hearing from parents and administrators of high-risk children, we’ve provided their classrooms with portable HEPA air cleaners to use year-round. At one local elementary, a student has cystic fibrosis; we provided her school with two air cleaners, and this will help with wildfire smoke in the fall and wood smoke in the winter. Our efforts have also included educational outreach to our community about the health impacts of wildfire smoke and how to stay safe. We launched a new website: MontanaWildfireSmoke.org, worked to understand the community’s needs, and partnered with the University of Montana to monitor air quality in various indoor locations. Although each of these steps has moved our community towards becoming “smoke-ready,” we’re not there yet. Most students, employees, and families still spend significant amounts of time inside spaces that are not yet capable of filtering out harmful particles. Decades ago, we didn’t understand the importance of creating clean indoor air during wildfire season; we rarely had weeks, or months, of stifling smoke. As wildfires have grown in duration, size and intensity, health research has been scrambling to keep up. While this research is a growing field, it has shown time and again that breathing wildfire smoke can be incredibly harmful. We also know that climate change, caused by our carbon emissions, is lengthening our wildfire seasons, and thereby increasing the dangers posed by wildfire smoke. Missoula is an innovative and compassionate town. We’re working collaboratively to better prepare for a changing climate, and, importantly, are moving forward with climate solutions that reduce the pollution that causes climate change. We invite the community to join in our efforts and take steps toward both becoming smoke ready and reducing carbon pollution. Sarah Luth, Health and Climate Coordinator, Climate Smart Missoula. October 9. 350 Montana: Why Spokane voted to go 100% RE. 7pm, upstairs of the Union Hall. October 12-13: Faith, Science and Climate Action Conference. The Emerson Center, 111 S Grand Ave, Bozeman. October 15. Open Space: yes or no. City Club Missoula. 11:30am – 1pm. Double Tree Hotel. October 20: Missoula Clean Energy Expo, Caras Park Pavilion, 11am-3pm. Climate Smart Missoula and partners. Family-friendly, free and open to the public. October 21: 23rd Annual Pumpkin Run – Proceeds uill go towards energy efficiency measures at the new Missoula Public Library. October 26-28. AERO EXPO in Missoula. View more climate and energy events via the Climate Smart’s Calendar. There are many more conservation events for the upcoming months HERE.